Hoping to re-open her mother’s hotel in light of her passing, Sophie (Amanda Seyfried) learns about Donna’s (Meryl Streep) past as life-changing events begin to mirror those of her late beloved mother’s in ways that will affect more people than expected. The first Mamma Mia! is rightfully considered by many to be the cinematic embodiment of carefree fun and it left throngs of ABBA fans wanting more. 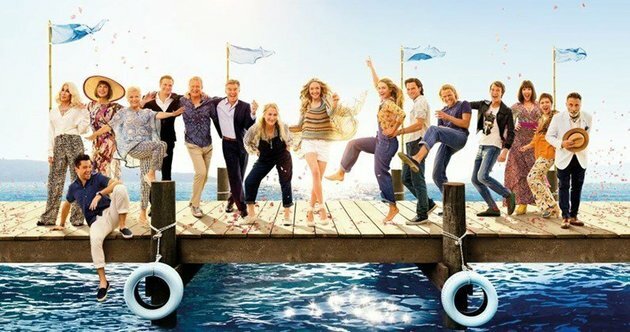 Bolstered by nostalgia and its fans’ goodwill, Mamma Mia! Here We Go Again did the most logical thing to appease its musically-oriented fans: by being The Godfather: Part II of musical movies. As a sequel, Here We Go Again stumbles with its inconsistent tone, where ABBA’s poppy songs clash with a plot centered around a major character’s off-screen death. 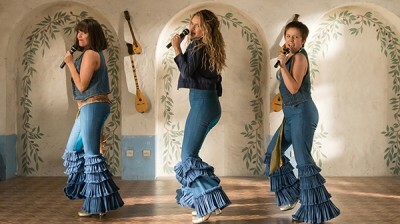 Granted, some of the songs have appropriately heartbreaking lyrics, but the upbeat melodies and impromptu duets undercut what should be dramatic moments – because nothing spells mourning the movie’s severe lack of Meryl Streep for an hour and a half better than watching the younger Dynamos sing the movie’s titular (and lively) song. Outside the presence of ABBA, the second Mamma Mia! lacks almost everything that made its predecessor enjoyable. Gone is the vibrant energy fueled by a cast of veteran actors and a silly Greek Chorus singing and dancing to some of the most popular songs of the ‘70s, and in its place are younger actors who perform the songs that would normally be found on Side B of ABBA’s Greatest Hits Collection. Worsening this problem are the aforementioned rookies who convincingly play the original’s main cast’s – Donna, Rosie (Julie Walters) and Christine Baranski (Tanya) aka the Dynamos and Bill (Stellan Skarsgard), Harry (Hugh Grant), and Sam (Pierce Brosnan) aka Donna’s suitors/Sophie’s dads – younger selves and nothing more, taking up so much time that they relegate the first movie’s major draw (i.e. watching the fifth James Bond sing karaoke) to glorified cameos that were probably the result of contract conflicts or their lack of interest in the sequel. Those who were hoping for another boppy trip down memory lane set against the backdrop of majestic Greek islands will be disappointed to find that the sequel’s as exciting as a funeral whenever the music stops. But given the sequel’s central themes and its ambitions, this change of pace was necessary, despite it being one hell of a downer. In ways that are oddly similar to the second chapter of Francis Ford Coppola’s gangster epic, Here We Go Again splits its run-time between Sophie’s present life after the events of the first movie and her free-spirited mother’s journey of self-discovery that eventuall led to Sophie’s birth. Themes of motherhood, heartbreak, regret, redemption and family are a major focus in Here We Go Again, and seeing how Sophie’s life parallels with that of her mother’s will illicit emotional responses from viewers at the right moments. Unlike The Godfather Part II and as mentioned earlier, Here We Go Again suffers from tonal dissonance that undermines certain scenes while also becoming a victim of its own tediously brisk pacing. Due to the sheer number of B-plots and mini-character arcs going on, Here We Go Again has no choice but to rush through some important beats that had a lot of potential for added character depth and development. Some of these missed opportunities include Donna’s life-long conflict with her mother Ruby Sheridan (Cher), Sky’s (Dominic Cooper) difficult life choices, and Sophie’s impending motherhood – all of which are resolved in a heartbeat. Not helping matters is that Here We Go Again bears no surprises, and is even more predictable than its predecessor – that, and the fact that the trailers spoiled the whole movie. Compared to Mamma Mia! which elevated its bare-bones story by being an undeniably good time with a charismatic cast, Here We Go Again has almost nothing to rest on, given its heavy reliance on serviceable duets and solos over the first installment’s dance numbers and big personalities goofing off to ABBA tunes. Here We Go Again prioritized its emotional weight by limiting its entertainment value, but it did so by sacrificing everything that made Mamma Mia! so memorable in the first place. Here We Go Again is a step down from the first movie, but it’s hard not to admire its sincere intents to be more than just a sequel that lazily recycled the previous movie’s formula as most follow-ups would do. Mamma Mia! 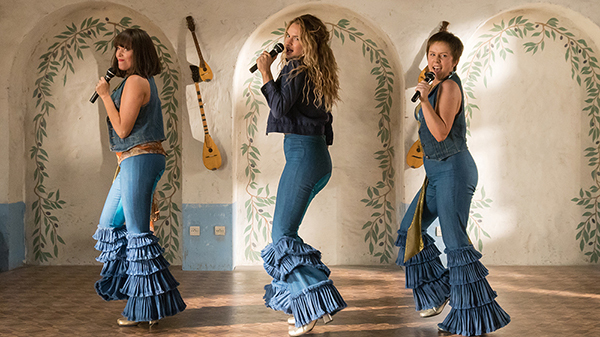 Here We Go Again fails to reach its desired heights and won’t be remembered as well as Mamma Mia!, but it boasts effort, a fair share of genuine emotional moments and song numbers that are worth listening to – in its flawed yet charming ways, it’s still irresistible. Just don’t expect to be in the mood for a dance any time before the end credits roll. REVIEW: ‘CALL ME BY YOUR NAME’ Gets Real With Love!